This week Sports Illustrated ran an interesting article, "Where Are They Now?" 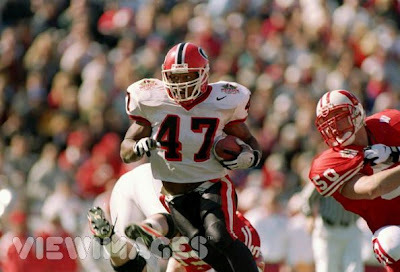 Tennille, Georgia native and former Washington County High School (GA) and University of Georgia great Robert Edwards was one of the featured athletes. For many football fans, the first thing that comes to mind when they hear Robert's name is his unbelievably horrendous knee injury following his rookie NFL season with the New England Patriots. He had been invited to Hawaii to play in a beach four-on-four flag football game with other NFL rookies. He landed in an awkward manner while breaking up a pass, tearing three of the knee's four major ligaments. The ACL, the MCL, and the PCL are not bowling leagues, if you're wondering. They are the ligaments blown out on Edward's left knee. Now add to those three, a damaged major nerve and a sliced artery which brought on the very real possibility of amputation. That's the makeup of the worst knee injury in football. Before or since. Forget football, let's aim for walking again, and without a crutch would be like Christmas. After doctors saved his knee, the faith and fortitude of Robert Edwards took over. He spent two excruciating years of rehab , enduring immeasurable pain. He had swelling and scarring, and he couldn't pick his foot up nor turn his ankle until the severely damaged nerves regenerated. Let's not overlook the traumatic nightmares he had of having his leg amputated either. But miraculously, he recovered and regained most of his agility and speed. He played in twelve NFL games in 2002 before landing in the Canadian Football League. In a cost cutting roster reduction, he was released by the Toronto Argonauts this January. The improbable comeback was now complete. He not only walked, he ran again. He not only ran, he ran fast again. He was no longer an injured football player, he was a very good football player. Again! You just can't help but wonder what the career would have been without the injury. Just as you wonder about Bo Jackson, Mickey Mantle, and other great athletes. But injuries are a real part of sports. And for people with the character of Robert Edwards, overcoming the injury might not define the career, but it sure defines the essence of the man.